Please check each property's availability calendars for more details, or use our search facility - selecting a Monday (4 nights) or Friday (3 nights) start date will provide the best results. Cala is an exceptional home that sits on a hill, nestled in nature, with dramatic views of Loch Nedd and the magnificent Quinag mountain. The house was designed by Mary Arnold Forster and was featured in the More 4 TV series, Impossible Builds. Eilean Mor Cottage is a beautiful little retreat located in the small village of Skinidin in the north west part of the island. Sitting in an elevated position the cottage enjoys panoramic views to Loch Dunvegan and to the Outer Hebrides in the west. Fon Tobar is a fantastic spacious self catering property set in a breath-taking location. The property enjoys panoramic views across Loch Pooltiel and towards the Minch and the Outer Hebrides. Gracie's Cottage is a traditional detached cottage situated on the shores of Loch Kishorn in the small village of Achintraid. The location of the property makes it an excellent base for exploring not only the west coast but also the Isle of Skye. Hill Cottage is a traditional stone cottage set on its own at Fanagmore with stunning views over Loch Laxford. The property is ideally located to experience this regions remote natural beauty with secluded bays, sandy beaches and towering cliffs. Hillview-Glenlivet is a former estate house furnished to a high standard with an open fire. Located in the Cairngorms National Park the area is rich in wildlife and offers endless possibilities of things to see and do including winter skiing holidays. Katies Cottage is a traditional property originally built in the 1900's. It sits in an elevated position overlooking the glen of Glendale. The property has been extensively renovated and is an ideal base for exploring the north west part of the island. Kilmaluag Cottage is a newly built property located in North Duntulm on the Trotternish Peninsula. The cottage sits just a couple of metres from the sea, and is surrounded by some of the most awe-inspiring scenery that the island has to offer. Kimberley House is situated in the picturesque village of Findhorn and enjoys panoramic views across Findhorn Bay. The property offers luxury accommodation in the very heart of the village with amenities close to hand. Littlepark Cottage is a former railway cottage adjacent to the West Highland railway. The cottage is tastefully furnished in a traditional style. The location makes it a convenient base for skiing, walking, fishing and cycling. Loch Cottage is a traditional property located on the edge of Loch Pityoulish in the heart of the Cairngorm National Park. The property makes an ideal base for exploring the park with the village of Aviemore located just five miles away. Marnie's Croft, a detached property set in attractive gardens has magnificent views of Loch Ness and Urquhart Castle. The cottage is private and secluded, so lots of wildlife to be seen in the garden. It is also a great place for 'Nessie' spotting. Matheson's Croft house is situated in a secluded spot with views across Loch Alsh. Beautifully restored and retaining much of its original character the property has reclaimed wood floors throughout and a eclectic mix of modern and traditional furniture. Moat House 1 is in one of the oldest parts of the Abbey. The apartment is situated over two floors with ground floor access. The apartment has been furnished with comfort in mind and is ideal for a relaxing holiday close to Loch Ness. Moat House 10 is a duplex apartment adjacent to the Moat House and is an ideal retreat for anyone wanting to spend some quality time just relaxing, and enjoying the atmosphere of this historic abbey. Walking, cycling and golf can be enjoyed locally. Moat House 7 is a charming and comfortable apartment situated on the top floor. The apartment has views onto the cloisters and Monastery bell tower as well as the spacious grounds. Fort Augustus and Loch Ness is a short walk from the apartment. Moat House 9 is a duplex apartment attached to the original Moat House and has direct access from its ground floor reception rooms into the Abbey gardens. The apartment is ideal for a couple or a small family wishing to stay at the Abbey. Moll Cottage can be found in a quiet coastal location with unspoilt views towards Scalpay and Raasay. The cottage is beautifully furnished and equipped to a high standard, and would make a perfect retreat for a couple. Monastery 17 is situated on the top floor and has a large open plan living area with a view of Loch Ness and also looks out on the cloister gardens. The bathroom in this apartment has the most magnificent view of Loch Ness. Oak Cottage is located just over two miles from the pretty village of Killin. Killin itself is a traditional Highland village which sits on the very edge of Stirlingshire's border with Perthshire, and is part of the Trossach's National Park. The Old Dairy is a comfortable ground floor apartment located just four miles from the village of Beauly. The property with its peaceful location is set in a small courtyard and located beside Aigas Golf Club. Old School 10 is a first floor luxury apartment with views over the grounds to the canal and hills beyond. The four arched windows bring light and wide vistas to the spacious lounge. A short walk through the grounds takes you to shores of Loch Ness. Old Smiddy originally a blacksmith's workshop and forge now converted to a delightful cottage for couples - a true honeymoon tryst. Pier Head is situated in a fabulous sea front position in the picturesque village of Shieldaig. Newly renovated the property offers spacious accommodation for a family or for a group of friends, looking to explore the west coast further. Pipers Lodge is a newly completed property with its own hot tub, situated in the small township of Borreraig in the North West part of the island. Sleeping two guests, the house makes an ideal base for exploring or for a romantic short break bolthole. Pooltiel House is ideally located for enjoying the north west corner of the island. The house offers fantastic views over Loch Pooltiel to Dunvegan Head, and towards The Little Minch and the Outer Hebrides. Poulary Cottage is a traditional country cottage with wood burning stove. Set in its own 13 acres of land with beautiful views across wild country to a mountain loch it is ideally situated to get away from the hubbub of life. Redkite Log cabin is aptly named as many red kites are seen overhead in this rural location. The chalet is well equipped and provides comfortable accommodation close to Inverness and is ideally located for touring the Highlands and Islands. Reyflat Barn is a unique property situated less than ten minutes drive from the village of Rosemarkie on the Black Isle. The property sits in an elevated position with views across rolling farmland and down to the Moray Firth coastline. Rhundunan is a property of traditional style with a contemporary interior finished to a high standard. It is situated in an elevated position to provide stunning views, and is located within walking distance of the famous Three Chimneys Restaurant. River Cottage is a unique property ideal for a couple, just one mile from Drumnadrochit and Loch Ness. You are well placed here to visit the Isle of Skye, the Northern Highlands or closer to, Glen Affric is just 30 minutes away. Rowan Cottage is situated in the small village of Arrina on the Applecross peninsula. The property is equipped and furnished to a high standard and it's position makes an ideal base for exploring this remote and scenic area. Rowan Lodge is located in a quiet woodland position just a short walk to the shores of Loch Ailort. This area of Moidart is known as the "Pearl of the West" and offers stunning scenery and an abundance of wildlife. Score Bay Cottage is situated in the small township of Duntulm which is on the most northerly part of the Trotternish peninsula. The property is situated in a quiet location and enjoys spectacular coastal scenery with views to the outer hebrides. Seabank Cottage sits in an enviable shoreline position in the village of Lochcarron. Lochcarron with its village amenities close to hand is a perfect location for a holiday, and for those wanting to explore the west coast and the Isle of Skye further. Sgarbh Lodge is a traditional croft house, beautifully renovated and located in the small hamlet of Lower Milovaig. The property enjoys panoramic views over Loch Pooltiel and towards the Western Isles. Shellach Cottage is a charming property situated in the pretty village of Lochcarron. The property offers the perfect base for exploring the west coast and the Isle of Skye. Lochcarron itself offers a good range of facilities for the visitor. Shepherd's Cottage is a newly completed luxury renovation of a former 19th century cottage. Situated in a secluded position the property is ideal for those guests looking to get away from it all in a unique and remote setting. Shore Cottage is a lovely property situated just a short distance from Stranraer and the ferry ports from Ireland. This traditional property has an enviable position and benefits from having an large wild two acre garden with direct access to the beach. South Lodge is located in a rural and secluded position and offers panoramic sea views across West Loch Tarbert and south to the Sound of Gigha. The cottage is located on the Ardpatrick Estate which lies ten miles south west of Tarbert. Stable Cottage is located in the heart of the Lochnaw Castle Estate, two miles from the village of Leswalt and just six miles from Stranraer. Guests that stay are free to enjoy the historic estate grounds, including the beautiful gardens & woodland walks. Stac Polly - Situated on the Achiltibuie peninsula with views to the Summer Isles, this contemporary luxury property is equipped to the highest of standard including a hot tub and a sauna. Station Cottage has been renovated from the Station Masters home and retains much of the original character with cosy lounge and wood burning stove. Set on the edge of the village, it is an ideal base for exploring the Cairngorms National Park. Stoer Lodge is situated in the small hamlet of Stoer, close to the fishing port of Lochinver. The property enjoys an elevated position with uninterrupted views to Stoer Bay and the dramatic peaks of Stac Pollaidh, Suilven and Canisp. Taffs Barn is a unique property conversion situated less than ten minutes drive from the village of Rosemarkie on the Black Isle. The property sits in an elevated position with views across rolling farmland. Taigh Druim is a traditional cottage with a contemporary interior, finished to the highest of standards with wood burning stoves. The views offered from the property are truly outstanding to the mighty Cuillin and the Isles of Soay, Canna, Rum and Eigg. The Beach House at Garrachan is a stunning property located in a quiet position on the edge of Loch Dunvegan. Stylishly furnished and equipped to a high standard. The property is located just a short distance from Dunvegan with all its amenities. The Bothy is nestled in a quiet spot in the small hamlet of Achnashellach, which is a short drive from Lochcarron. The property would make an ideal location for walking in the surrounding hills, or as a base for exploring the west coast further. The Byre, Glasphein is an outstanding architecturally designed house situated in a quiet location near the village of Glendale. 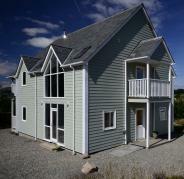 Newly completed, it enjoys fabulous views towards Loch Pooltiel and over the surrounding hills. An ideal retreat for a couple. The Granary has been renovated to a very high standard, it was originally a grain store for the Manse nearby, and now provides quality accommodation close to the village of Drumnadrochit. The Mill is situated within the Cairngorms National Park. The property is part of a recently completed barn conversion that has been furnished in a contemporary style and is equipped and furnished to a high level. The Mill at Glenlivet is a detached stone built property located high in the hills overlooking the village of Tomnavoulin. Beautifully renovated this original threshing mill retains many original features and offers an ideal base for exploring. The Orchids is an outstanding property, beautifully and stylishly presented and equipped and furnished to an extremely high standard. Its location makes a fabulous base for exploring this part of the island and is close to the Three Chimneys Restaurant. The Stables is a unique and quirky cottage sitting in the heart of Crail, one of the most beautiful fishing villages in the East Neuk of Fife. With village amenities close by, this property makes a perfect base for exploring the Kingdom of Fife. Tigh-na-Craobh (The Tree House) is a stunning contemporary house, designed by award winning architects Rural Design and finished to the highest standards. Beautifully situated and providing views to Ben Tianavaig and across the sea to Raasay. Toberaie is a traditional detached highland cottage located in a secluded position not far from the village of Nethy Bridge, in the Cairngorm National Park. The property enjoys unrivalled panoramic views to the Cairngorm Mountains and Strathspey. Tor Cottage is a luxurious property located near the small village of Tarbert on the Isle of Harris. Positioned to take full advantage of the magnificent views, and an ideal location for a romantic break or family holiday. Tor Fionn is a beautiful property which enjoys uninterrupted views overlooking the sea loch in the village of Lochcarron. The property is ideally placed for exploring the west coast and the Isle of Skye. Village amenities are within walking distance. Torvaig Cottage is a traditional style croft house located in a quiet position not far from the small town of Portree. The property makes a perfect base for exploring Portree and the other parts of the island. Udrigle House is a wonderful grade A listed property built around 1700, situated just over one and a half miles from the small village of Laide. The coastal position enjoys panoramic views over Gruinard Bay and towards the Suumer Isles in the north. White-Tail Croft sits is a fabulous hillside location just a short distance from the town of Portree. The property newly completed is stylishly furnished and equipped to a high standard, including a sauna. Whitestone sits in a commanding position with panaromic views of the Spey Valley. The property originally built to house employees for the nearby distillery is tastefully furnished and its position is an ideal base for exploring the area further. The Skye Woodhouse based on the style of a traditional scottish longhouse is situated on a remote headland in the north west part of the island. The spacious property has been furnished with an ecletic mix of antique and modern furniture by the owner.